Vanguard is not like other divisions within The Art of Warfare (TAW). It is a place where new and potential games are scouted, tested and evaluated to become full divisions in TAW. Some people may consider the games or, like we call them ‘teams’ in Vanguard to have their training wheels on. We like to think of Vanguard as a staging area for new divisions to be built; from the ground up. New teams that form within Vanguard to play games are built up, not down. By this we mean, when a team first starts, we do not assign any leadership positions. The only positions that do get assigned within the team’s first few weeks of creation are the Drill Instructors positions. After a few matches then a couple of squad leaders may be assigned. Its all based on that person’s involvement in the team and the game. Once the team and Vanguard staff has created a stable environment, then more leaders will be appointed to allow the team to become self-sufficient and to run its' own day-to-day administration. Then the team can start to schedule its’ mandatory matches without the help of the Vanguard staff, except for certain personnel movements and promotions. Once the team has achieved this and only once it can stand on its own two feet, then it will be considered for the move to the TAW army. We are also here to look at potential games that you as a TAW member would like to see in TAW army. 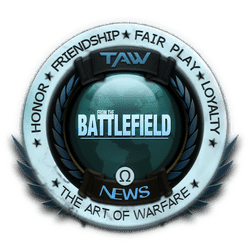 Maybe there is a game that you would like to be a part of or you think that it would allow clan play within TAW. We are always ready for suggestions and our "TeamSpeak doors" are always open for you to come in and discuss a game. The below form link button will allow you to put games forward for consideration and the reasons you would like to see the game in TAW. We do ask that you look at the Potential Games List, and our Imminent Games List on the TAW website. As well as Vanguards WIKI to see the games that we are looking at before you fill in the form. 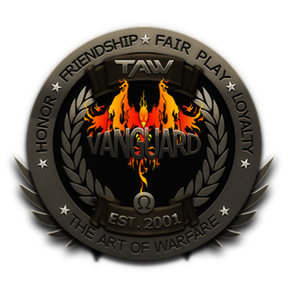 If you have any further questions about Vanguard, the games being spun up, or the games being considered, please email Kingcheese@taw.net or Talisac@taw.net for further information.